1942 Dad sleeping I walked Down to P.O. & Back got letter from Lydia. Mrs Harris is up at S.F. 1943 I washed Dad worked Days Bud went To Santa Monica Not Much News. Marie & Mable came over & we had chicken Dinner. 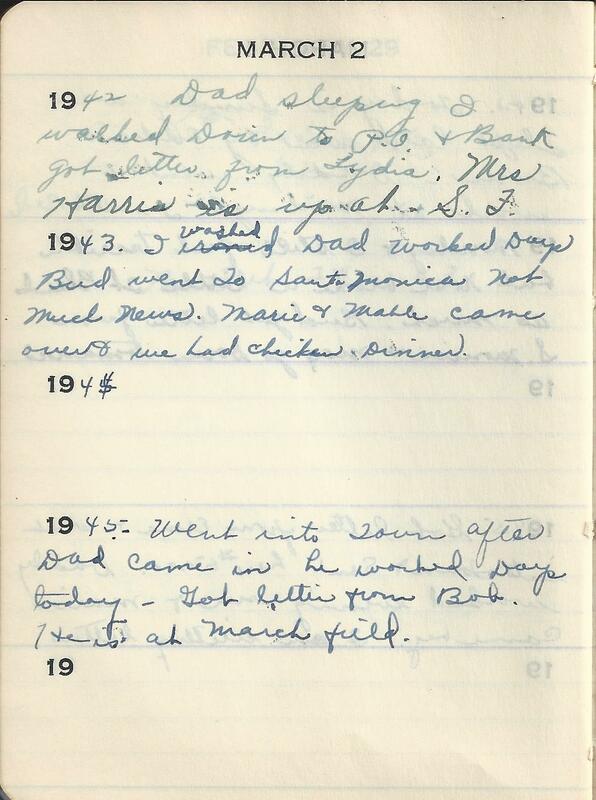 1945 Went into Town after Dad came in he worked Days today – Got letter from Bob. He is at March field. I’m assuming that the Lydia mentioned in 1942 is her sister Lydia and the Bob she mentions in 1945 is her son, Robert Aubrey Tennant Jr. She usually refers to him as Bud but I don’t know of another Bob that would be writing them.